When Bullet For My Valentine started out over a decade ago, they were known as Jeff Killed John. The years passed, and the band took on their current moniker. Eventually they started gaining label attention, and a few came knocking, including Roadrunner and Jive. When push came to shove, Bullet for My Valentine didn't have any problems signing to the label home of folks like Britney Spears and Chris Brown. Not that the pop stars had anything to do with the band's decision. It was more of a big fish, small pond sort of scenario. "We're the only metal band on that label, and we get 100 percent attention because of that," explains frontman Matt Tuck to Noisecreep. "If we went on like an independent, kind of smaller, underground label like Roadrunner or something who only signed metal bands and already had 100 of them -- I mean, they kind of market it to a certain level and they just don't have the expertise and the power in the music industry to push you to a big level. And being on a major label like Sony, Columbia and Jive, they kind of dominate the industry. And they have an endless supply of power and money to promote you and help you." In the end, Tuck explains that it was an "easy decision" to go with Jive over Roadrunner and other labels that presented offers. The band was offered artistic freedom and the chance to grow as a band for the next two decades. At the end of the day, a lot of decisions made by the members of Bullet for My Valentine revolve around longevity. From deciding on a label to picking touring mates to song selections for new albums, everything the band does is geared toward the timeless. When they hit the road this spring on the back of 'Fever,' they'll have support from Airbourne and Chiodos. Now a headline act, Bullet for My Valentine get the honor of choosing their own tour support and Airbourne was high on the short list. "They're just a really great, solid live rock 'n' roll band," says Tuck of the Australian rockers. "You always kind of like to pick a little bit more of an eclectic bill than just having three or four bands of the same kind of genre. We handpicked them for the fact that they're very different to us but they're very, very good at the same time. We don't care, it's not about being 'upstaged' for us, it's not about that. It's about putting on a good nights worth of entertainment for a ticket price." A new album also means news songs in the set. 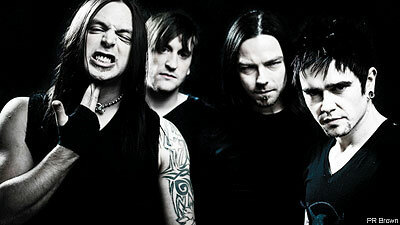 Expect to hear at least five new cuts from 'Fever' when Bullet for My Valentine tour this spring and summer. In fact, Tuck says he'd love to play the full album, but he knows fans like more of a variety. The band has several festival gigs booked for 2010, including Download, Rock on the Range, Rock Am Ring, Nova Rock and more.